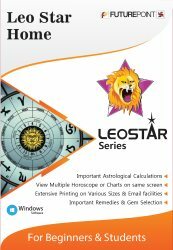 Horoscope software Leostar Home Edition is bestseller in the market of astrological softwares. This jyotish software is most affordable & dependable astrology & horoscope matching software available today for astrologers and that is why it is recognised as best horoscope software. Comprehensive astrological calculations of this Jyotish software include - Avakhada, Ghatchakra, Tara Chakra, Panchang, Calendar and Kundli Milan. The modules that one gets in jyotish software Leostar home package are Teva, Tables and Matching. Jyotish Software Leostar Home can cast all types of Vedic charts like Lagna, Chalit, Bhava cusp and various types of divisional charts. This jyotish software supports all Astrological Systems. Shodash Vargas(16 divisional charts)- Saptavargas, Shodashvargas are included in this software for jyotish. This Leostar Jyotish software contains method of gem selection on the basis of Dasha, specification of metal, finger, wearing gem on the basis of planet and Nakshatra. This jyotish software also incorporates Mantras for Grahas, Sadesati and articles of planets for donation. The striking features of this great astrology software are as follows- 1) Inclusion of all important divisional charts, 2) facility of horoscope matching on the basis of ashtakoot guna matching and manglik dosh compatibility, 3) Objective of Astrology is to give accurate predictions about future but its utility lies in prescribing the correct remedies and this astro software gives remedial measures like lucky gem, navgrah Mantras and articles for donation. 4) All types of astrology tables required by astrologers are incorporated in Leostar. Astrological calculations of Leostar Home include - Teva-Lagna Charts, Sun Charts, Moon Chart, 16 Varga Charts, Planet Degrees/House, Avakhada, Ghatchakra, Tara Chakra, Panchang & Calendar. Jyotish Software Leostar Home can cast all types of Vedic charts like Lagna, Chalit, Bhava cusp and Shadvarga (6 divisional charts) Saptavarga (7 divisional charts), Shodash Vargas (16 divisional charts). Dasha-Vimshottari, Shodashottari, Yogini, Ashtottari, Char & Kaalchakra Dasha upto 5 levels. Gem Selection, Gem wearing, Mantras, Donation, Sade-Sati, Manglik Vichar & Kaal Sarp Yoga. Can give detailed printing on all size stationery. Longitudes/Latitudes- Coordinate database of over 20000 cities.